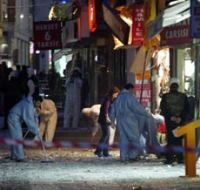 The cause of the explosion on a busy street in the European side of Istanbul was not immediately known. A police official said three people were injured in the blast, which comes amid heightened tension in Turkey over attacks by separatist Kurdish rebels. The official was speaking on condition of anonymity because of rules that bar civil servants from speaking to journalists without prior authorization. Last month, a suicide bomb attack in Ankara killed eight people and injured dozens of others. Turkish officials blamed the rebel Kurdistan Workers' Party, or PKK, for the attack. The group denied involvement. Militant leftists and radical Islamists are also active in the country. After the bombing in Ankara, Gen. Yasar Buyukanit, the military chief, warned that attacks could occur in other Turkish cities.